Your sweater is so inspiring, Aija-- and it looks absolutely fantastic on you! It's really lovely. I would be so proud if I made this from scratch like that. 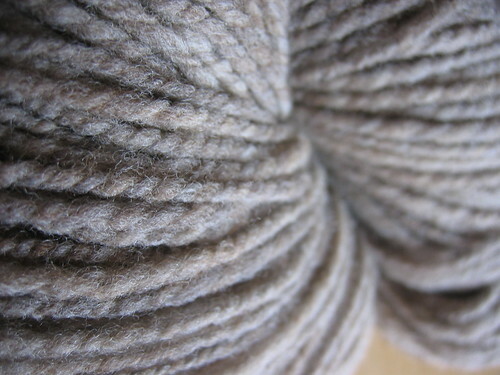 There is an oly Spindlicity issue that discussed knitting a smoke ring from yarn spun from thick to thin. Bravo! I LOVE, LOVE, LOVE your wisteria. The fact that you went from fleece to sweater, makes me love it even more. I know you are so proud of yourself. Hell, I'm overjoyed for you! So, what's next? That sweater is a masterpiece! 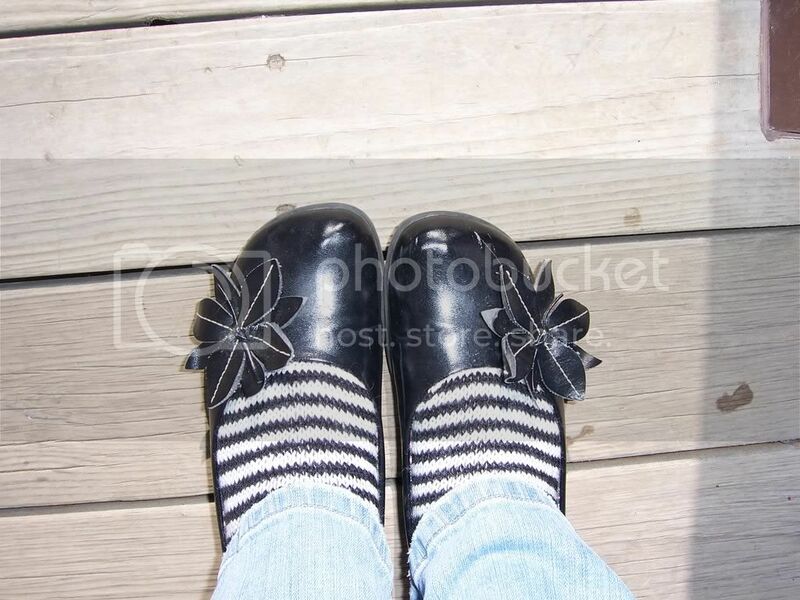 I hope you're still wearing it when you're 90. That must be the coolest to be able to say, "Why, yes, thank you. I did knit this sweater, and I also spun the wool for it." Wow! What an amazing accomplishment. Wow. The sweater is amazing! So cool that you *really* made it from *scratch*! Congratulations! What a wonderful journey! I've seen the word "inspiring" in several other comments, and that is just what I was thinking, too. Absolutely amazing! Wonderful spinning and knitting. 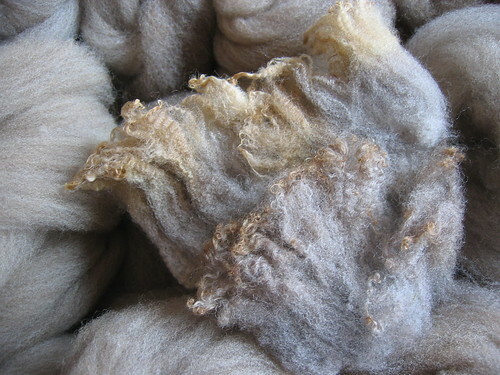 To prevent pilling, a fiber needs to be spun to the correct diameter - too thick for a fine wool and the fibers work loose to the surface, causing pilling. What weight did you spin your singles? That thing would make even the most fleece-skittish spinner long for spring. 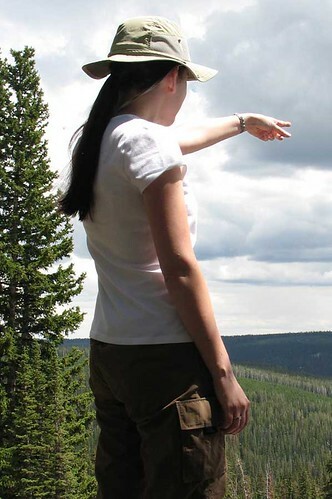 I look forward to the next fleece-to-finished project of yours. Super duper!!! And your speed, omg, I bow down to you (mumbling "notworthy, notworthy, notworthy"). I agree with your thoughts about the pilling. Curiously, I once knit a sweater from Berrocco Wensleydale yarn, which supposedly is/was a commercial worsted-prep, worsted-spun yarn, and it pilled, too. I'm guessing that was attributable to fiber breakage? Hard to know. Really, wonderful accomplishment you have there - love it. 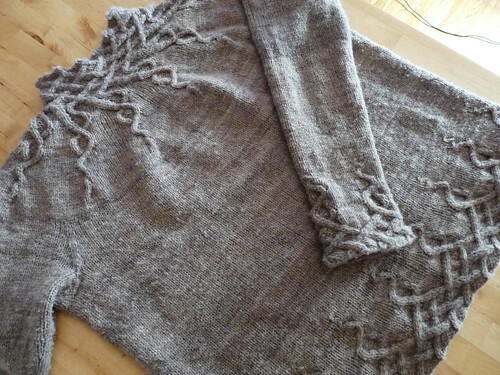 Your entire effort from prep to spinning to knitting is really impressive and inspiring! What a beautiful sweater! Wonderful!!! 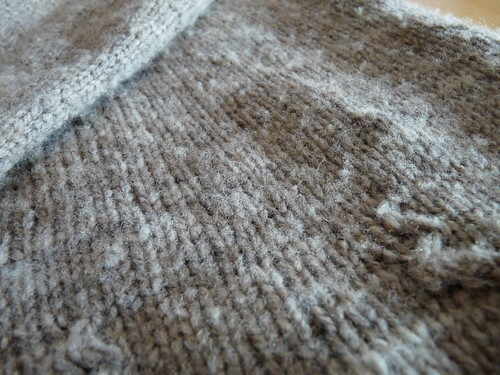 I love the sweater, and love it even more for knowing the journey of the fiber. I've been snagged by the love of raw fleeces lately too, and you make it seem so possible to go all the way from fleece to sweater! I'm on board!! So incredibly cool! 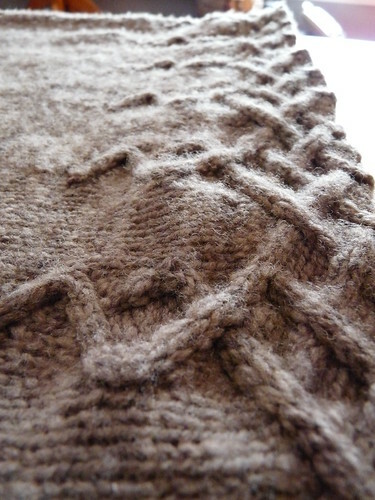 I love seeing the transformation from raw wool finished piece. Truly inspiring! Way to go, you!!! I love it. I'm currently knitting a gray/brown handspun cardigan and I know exactly what you mean about the color - it's making a button choice difficult! 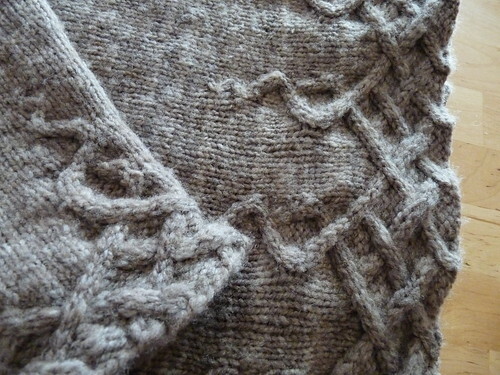 Oh, woe could I clear the schedule and work on my spun/in spinning sweater, now - yours has me all aflutter with desire for sweaters already running deep in my veins....so beautiful! And such a fine accomplishment! What a beauty! I'm going to start spinning for my own Wisteria over the coming months and yours is very inspiring. Your experience with the corriedale combed top and pilling is similar to my own and I'm experimenting with different things to try and remedy it before I begin. Thanks for sharing the start to finish. I just love the sweater! Wow! I am so impressed that you finished so quickly. The sweater looks great. Judith M-M would be horrified that you did not mix your bobbins but then again, you can always break the rules "if you have a good reason"! You have a really beautiful treasure! Wow spun and knit in such a short timeframe - you rock! I am so in love with this pattern - I may be making one too! Oh wow, I'm so impressed! I want to do this too! It's absolutely STUNNING! Excuse my ignorance, but could you also use a drum carder, or will that give you a different outcome on the spun yarn? Wow! Both yarn and sweater look amazing! this is beautiful, but... ummm... you scare me. like, i'm glad that you are fascinated with fiber arts because if you put the same genius/energy into weapons manufacturing we'd all be toast. 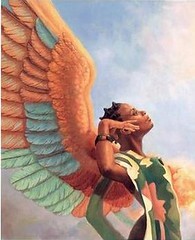 i am so in AWE of you! rock on!!! Wow. Just . . . wow. How amazing to be a part of every step of the process, and to do it all so quickly! Aija, you are HANDS DOWN my favorite inspirational blogger. HOW DO YOU DO IT ALL? Seriously, woman! Your spinning is to do die for. 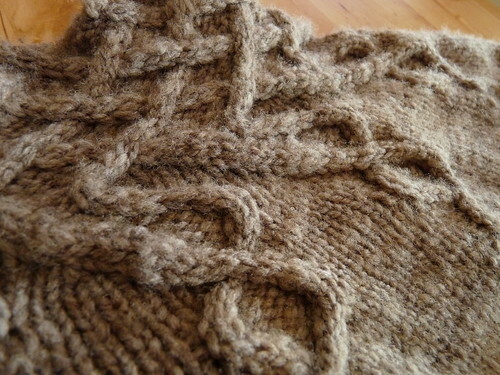 Your knitting is gorgeous. And I just love reading about your fibery adventures. Thanks for being so darned excellent! Wow! Lovely, and you knit it so fast. Which part of the whole process did you enjoy the most. It's is really beautiful. 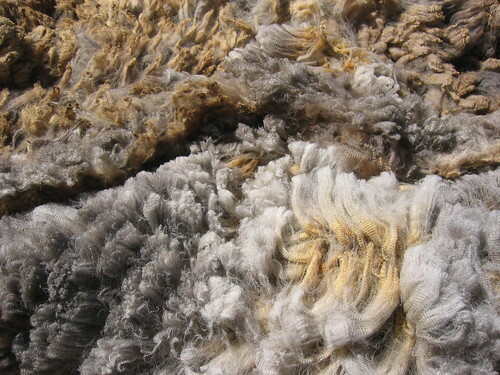 I am working with a beautiful fleece from Whitefish Bay Farm. 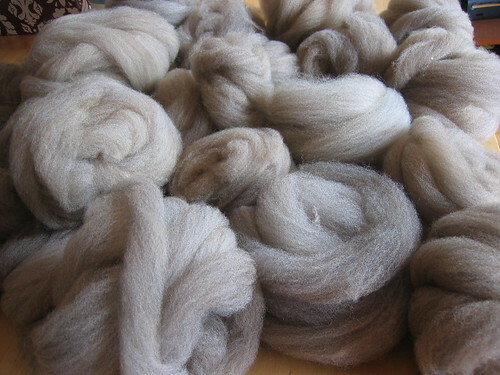 A gray silver fleece from a sheep named Tatiana. I am impressed at your quickness, combing, spinning, and then knitting. How many passes through the combs and what type of comb? I just go combs in August, English combs, 5 pitch.